Everything you need for a start! The bundle is perfect for starters like me, I especially love the shaving cream and the brush, however I found that the blade needs more sharpening, I didn't really get the closest shave that I hoped for, but I'm hoping maybe after few rounds of honing on that leather strap this might change. Anyway it's still a good deal. My wife got this for me and I love it. Very glad it came with the travel strap. Definitely a good strap to practice on. I never thought it was so easy to cut the strap. I would very much recommend this starter kit. I just got my straight razor kit today and used it for the first time. I got the most recommended and the razor was definitely shave ready and it was an awesome experience! After watching their youtube videos i felt more than ready to shave with the razor and i didn't even cut myself in the slightest. The company itself is very helpful. It took awhile to ship because they were out of the leather strop that was supposed to come, but they got in contact with me and were very helpful in figuring out how to fix the issue. Highly recommend putting the money into getting the kit, you will not be disappointed. 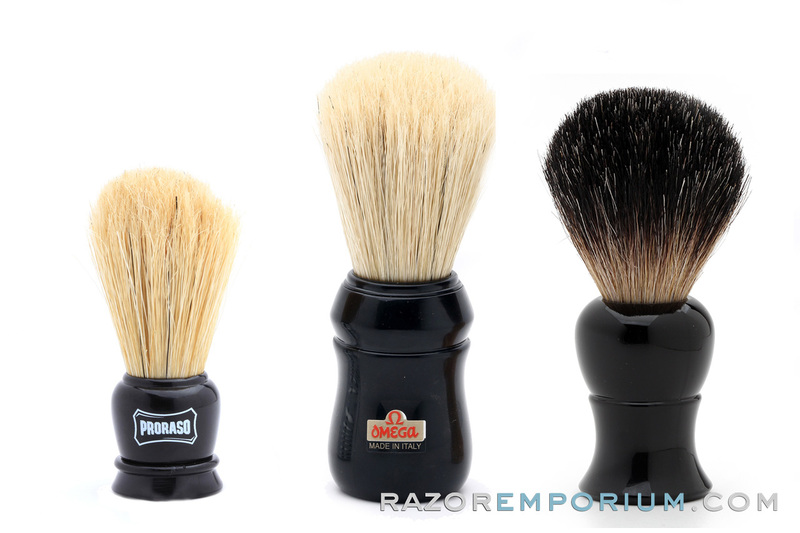 I purchased the shave starter kit and was very pleased with the blade as well as the poraso shave products. The blade is a refurbished Gold Dollar and is working well!! If you are thinking about it, BUY IT!!! Recently to writing this review I got interested in straight razor shaving. I did my research, or so I thought, and went to a Men's "shave store" in the local fancy shopping center. A number of variables, including a sales person who was clearly very new and left on his own to man the shop, and a straight razor that wasn't properly honed and prepped for sale, led me to a very disappointing and expensive experience. All the hype of straight razor shaving seemed to fly out the window in those first weeks of very underwhelming and frustrating shaved. I wasn't going to give up yet though! I had been following the Razor Emporium online and saw their video on their starter kits. Thank God for that. This kit comes prepped, with a razor that is already balanced, honed, and stropped. Man, it made a world of difference. The kit also comes with some great Proraso product, some of which I hadn't tried until the kit. I regret not finding this kit earlier - for the price and experience it is an absolute miracle. Cannot recommend this kit enough. Thank your Razor Emporium for putting in the work and attention to detail, and for this awesome kit. I foresee buying this kit as a gift for some of my friends come the Hollidays. Overall, the kit came with everything it stated online and was packaged nicely. I didn't receive it until 3 weeks after I ordered it but it was worth the wait. The GD 208 razor was shave ready and looked nice. I did get quite a few nicks but that's the result of using a straight razor for the first time and being a newbie to straight razor shaving inspite of all the video tutorials I've watched. As I'm doing this review I've used the razor a total of 3 times already and I've seen an improvement in my techniques and had less nicks. I'm still trying to get accustomed to using a straight and I know eventually by practicing I'll be a pro in no time. The proraso shaving cream smells pretty good and lathers nicely. 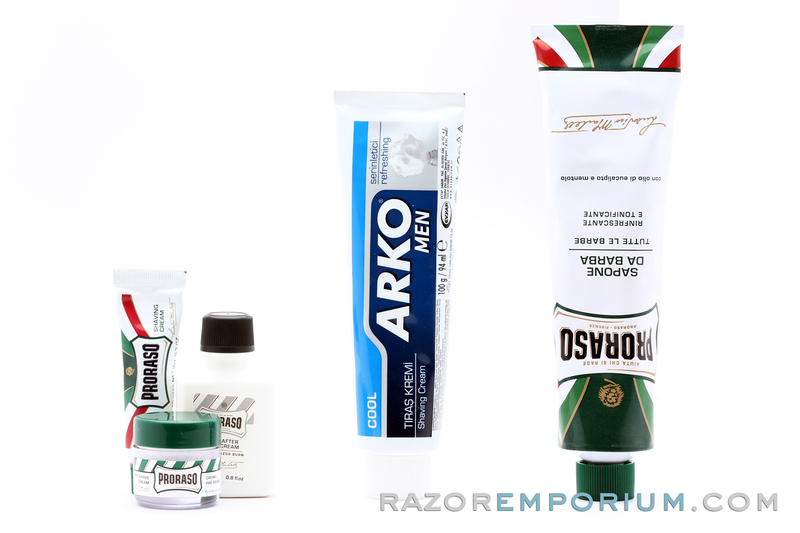 The pre-shave proraso cream smells just as good as the shaving cream and you can feel the menthol on your skin and if you like menthol like I do you will get a pleasant menthol scent emanating from it. The aftershave balm has a mild pleasant scent and is not overpowering at all. I didn't get any menthol feel on the skin and don't smell any in it. It made my skin feel good and smooth. I didn't get any dry feeling. The metal bowl is decent and sturdy looking and does the job if your looking to dab some of the cream in it and swirl the brush it came with inside as well. I've done the latter and developed a pretty good thick consistent lather with hardly any bubbles and nice peaks. I only used maybe a teaspoon of water to get those results. The brush is pretty small, smallest brush I have in my arsenal but it does the job for a brush with synthetic hair. What do you expect from a starters kit? Hopefully this review was helpful. It's a pretty good starter kit. I have no complains with the way the razor shaves and for the price you definitely can't go wrong. Also I received the product faster than expected, good logistics. Awesome product with an affordable price!